Hebrew: גדילן מצוי, Arabic: خرفيش جمال, Egypt: شوك الجمل "Shouk El-Gamal"
Scientific name: Silybum marianum (L.) Gaertn. Egypt: شوك الجمل "Shouk El-Gamal"
Silybum, Greek silybon, a term used by Dioscorides for thistlelike plants. Dioscorides wrote "the leaves and roots are a remedy for those that have their bodies drawne backwards." Pliny the Elder recommended the use of Silybum in the removal of bile. marianum, white-mottled leaves, referring to the story that the white marks on the leaves resulted from drops of milk shed while Mary nursed the Christ child. 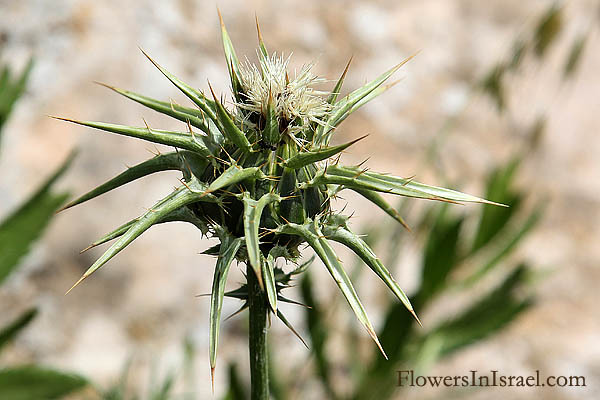 Carduus, thistle, the classical name. The standard author abbreviation Gaertn. is used to indicate Joseph Gaertner (1732 – 1791), aa German botanist. There are many Hebrew words which point to different kinds of prickly or thorny shrubs, like "thorns," "briers," "thistles," etc. 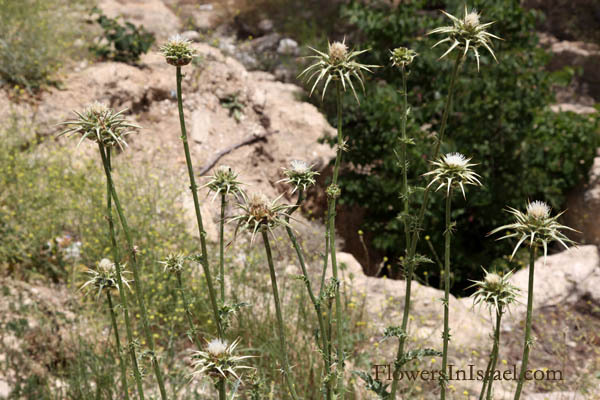 Some call Israel 'a land of thorns.’ One of these thorns is the Silybum marianum. 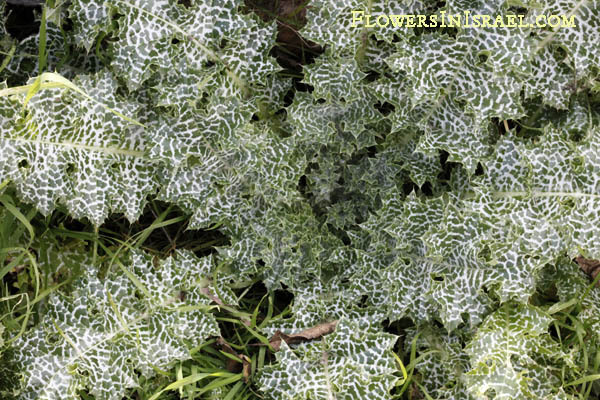 The plant is easy recognized because of the white veins on the leaves, which gave it the name of milk thistle. According to legend, the variegation on the leaves was caused by the virgin Mary’s milk as it ran down the leaves, hence the specific name marianum. This herb has been known in Europe and the Middle East since ancient times. Theophrastus (c. 371 – c. 287 BCE), in his book VI. 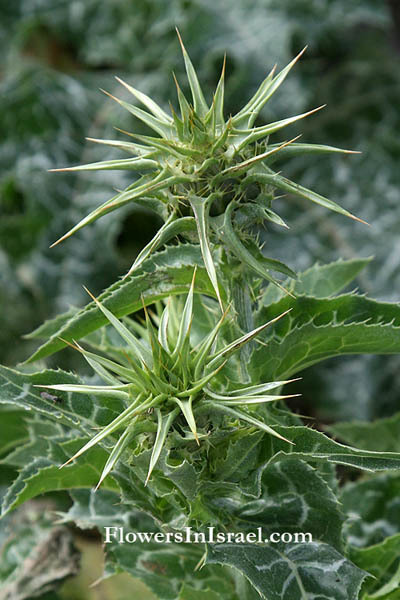 Iv.3 mentioned akorna, άκορνα milk-thistle. Dioscorides (circa 40—90 CE) and Pliny the Elder (23-79 CE) both wrote about the health benefits of Milk Thistle, and Pliny mentions that of the improvement of bile flow using Milk Thistle. In 1597 the prominent English herbalist John Gerard (1545 – 1611/12) wrote that Milk Thistle was the best remedy that grows against all melancholy diseases. The word melancholy is taken from the Greek, ‘black bile’, and in Gerard’s day referred to any liver or biliary derangement. In 1650 Nicholas Culpeper (1616 – 1654), the famous English botanist, herbalist, physician, and astrologer, reports that Milk Thistle is useful for removing obstructions from the liver. Albrecht von Haller Swiss physiologist (1708–1777) used milk thistle as a treatment for liver diseases. German scientists identified the key ingredient in the Milk Thistle called Silymarin, which is mainly in the seed that is highly restorative and protective for liver cells. Milk Thistle is also protective for the kidneys, brain and other tissues from chemical toxins. The German Commission E (a therapeutic guide to herbal medicine published between 1984 and 1994) approves the use of silymarin for the treatment of liver diseases, including hepatitis A, alcoholic cirrhosis, and chemically induced hepatitis. 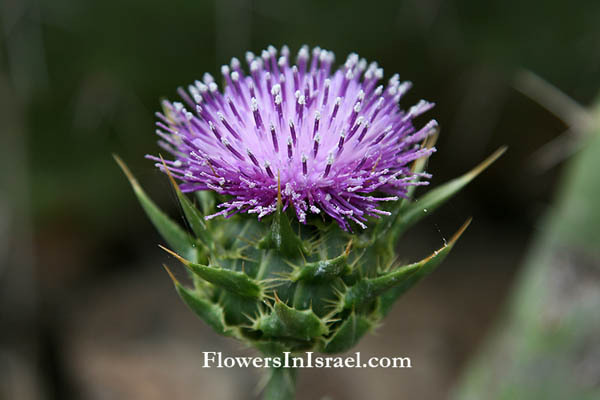 According to Harold Moldenke (1909-1996), an American botanist/taxonomist (Plants of the Bible): some 125 kinds of thistles now grow in the Holy Land, lending point to the prophecies in Genesis and Hosea. Of these the commonest and the ones usually cited for these Biblical passages are Centaurea calcitrapa, Centaurea verutum, Centaurea iberica, and Silybum marianum. Dr. Michael Evenari (1904-1989), an Israeli botanist, lists Silybum marianum and Notobasis syriaca. , It will produce thorns and thistles for you, and you will eat the plants of the field. But Jehoash king of Israel replied to Amaziah king of Judah: “A thistle in Lebanon sent a message to a cedar in Lebanon, ‘Give your daughter to my son in marriage.’ Then a wild beast in Lebanon came along and trampled the thistle underfoot. But Jehoash king of Israel replied to Amaziah king of Judah: “A thistle in Lebanon sent a message to a cedar in Lebanon, ‘Give your daughter to my son in marriage.’ Then a wild beast in Lebanon came along and trampled the thistle underfoot. By their fruit you will recognize them. Do people pick grapes from thornbushes, or figs from thistles? But land that produces thorns and thistles is worthless and is in danger of being cursed. In the end it will be burned.